Southampton boss Ronald Koeman fears Victor Wanyama could be out for up to five weeks after the midfielder suffered a hamstring injury in Wednesday's FA Cup win at Ipswich. 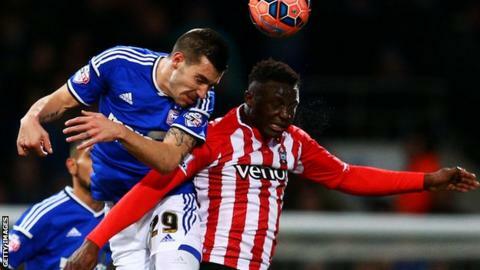 Wanyama had to be taken off seconds before half-time in the third-round replay, which the Saints won 1-0. Koeman, who said playing replays in an already busy schedule is "crazy", had initially planned to only play Wanyama for 45 minutes. "It is a real negative," he said. "We already have some other injuries. If it is a hamstring injury then he will be out for four to five weeks." Wanyama has been a key player for Southampton this season, making 24 appearances in all competitions. Injury means he could miss the visit of Liverpool on 22 February, as well as games against Newcastle, Swansea, Queens Park Rangers and West Ham. When asked if he will sign cover for Wanyama, Koeman added: "I won't necessarily go into the transfer market, I have young lads who we can use." Southampton, who are fighting for a top-four finish in the Premier League, already have a number of injury concerns, with midfielder Morgan Schneiderlin having to miss Wednesday's game against Ipswich because of a leg injury. "Schneiderlin has a similar thing to when he came back from the France national team - an abductor problem in his right leg," added Koeman. "He will be out for three to four weeks, like Toby Alderweireld. But we have a lot of young players. "We have good young lads and a good under-21 side. But sometimes it's too much and we have to protect them. We will see what we need to do. "We don't train in the last few weeks because we play so much and it's a problem about the schedule for players during the winter break. In what is normally a winter break, we have to play. "We have another replay. Why replays? It's another game and it's crazy."